Protesters outside the council meeting this evening. 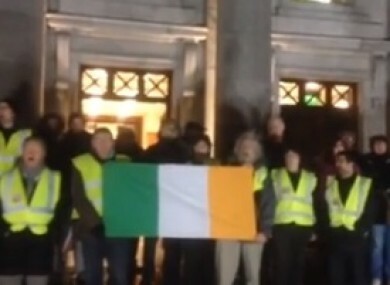 WATER CHARGE PROTESTERS stormed a Cork City Council meeting this evening resulting in it being suspended. Gardaí confirmed to TheJournal.ie that police were called to the city hall at around 5.30pm. No one was arrested. Anti Austerity Alliance Councillor Mick Barry put forward an emergency motion tonight on the jailing of five water charge campaigners in Dublin. Protesters who had been protesting outside the council building are believed to have entered the chamber, asking to be heard. Fine Gael Councillor John Buttimer told TheJournal.ie that councillors had agreed to hear the motion, but due to the protesters disturbing the meeting, the lord mayor had no option but to suspend proceedings tonight. “We had agreed the motion would be taken and we were just in process of deciding when in the evening we would discuss it when a large number of protesters entered the council. They wanted to speak, but they weren’t allowed,” he said. He said the debate would have taken place had the protesters not disturbed the meeting. “They might have had to wait till the end, perhaps two hours, but it would have been debated,” said Buttimer. Email “Gardaí called to Cork City Council after water protesters storm meeting”. Feedback on “Gardaí called to Cork City Council after water protesters storm meeting”.